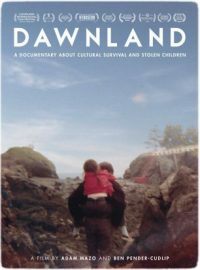 Join us for this Free showing of this moving and groundbreaking film, Dawnland: A Documentary about Cultural Survival and Stolen Children Learn about Maine’s Truth and Reconciliation Commission – the first of it’s kind in the nation. We are pleased to welcome two special guests who were integral in the creation of this film, Esther Anne and Mishy Lesser. Mishy Lesser, Ed.D., is the learning director for the Upstander Project and Education Fellow at the Thomas J. Dodd Research Center at the University of Connecticut. She is director of the Upstander Academy, a weeklong professional learning experience for teachers and museum educators that focuses on genocide and human rights education and the skills of upstanders. Currently Dr. Lesser spends much of her time researching and writing the five-inquiry Teacher’s Guide for Dawnland. Mishy authored the Coexist Teacher’s Guide to promote learning about the complexity of reconciliation in post-genocide Rwanda. She is a Circle Keeper and has been featured on WBUR (Boston) and PRI/BBC’s The World. Mishy was a Fulbright Scholar in Ecuador and spent 12 years learning and working in the Andes. Esther Anne, Peskatomuhkahti nil, Ckwaponahkiyik, nuceyu Sipayik. My name is Esther Anne, I am Passamaquoddy, part of the Wabanaki -the people of the dawn and I am from Pleasant Point. I joined the Edmund S. Muskie School of Public Service in 2003, engaging young people in foster care to ease their transition into adulthood. I had the honor of having a critical role as a Muskie staff person and a Wabanaki community member in the creation and establishment of the Maine Wabanaki-State Child Welfare Truth and Reconciliation Commission and Maine-Wabanaki REACH. I am now deeply engaged in the implementation of the Commission’s recommendations through the lens of restorative justice and decolonization. I earned my Master’s degree in Social Work at the University of Maine in Orono in 1997 and have served as adjunct faculty to the school. Currently, I facilitate the tribal-state Indian Child Welfare Act Workgroup and create products for tribal-state collaboration and best child welfare practice with native children and families through the Capacity Building Center for Tribes. I am working toward reclamation of Wabanaki territory, language, and ways of knowing and being. I enjoy making art, outdoor activities and spending time with the young people in my life.